Having got in late last night into Figueira da Foz, you would have thought that we would have slept in but no, both of us awake by 0800. We found an amazing indoor market by the beach with fresh fish, fruit and veg. 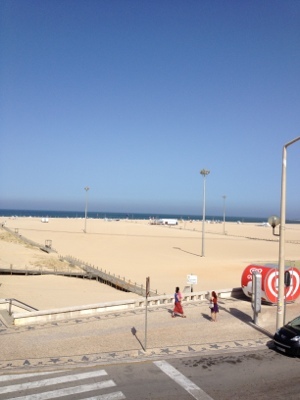 The beach itself is huge with walkways and even lamp posts! We left Foz around midday as good winds were forecast for the afternoon and the swell was increasing to 2.5m by evening so we thought we would continue on to Nazare – some 30nm south. In the event, the winds were quite light for downwind sailing so we had to motor the whole way. 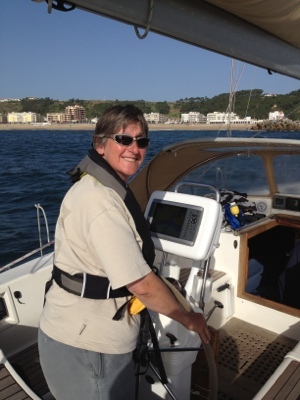 Nazare marina is run by an eccentric English couple who are quite sweet but definitely eccentric. 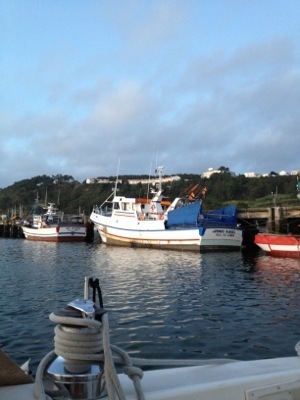 We are moored in the middle of the fishing harbour so lots of activity and no doubt lots of noise early in the morning! Photos below of the beach at Foz, the harbour at Nazare and the entrance with Jo in the picture as it has been noted that Liz has been hogging the limelight!